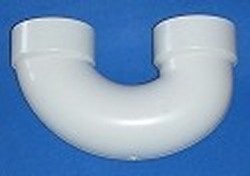 6" slip socket U-Bend. This is a DWV part (non-pressure rated). It'll work for gravity or very low pressure situations. Not recommended for flex pvc (hub socket too shallow.) Usually in stock.